It's the middle of April and Mother Nature keeps taunting us with sun-filled days that are still too few and far between. 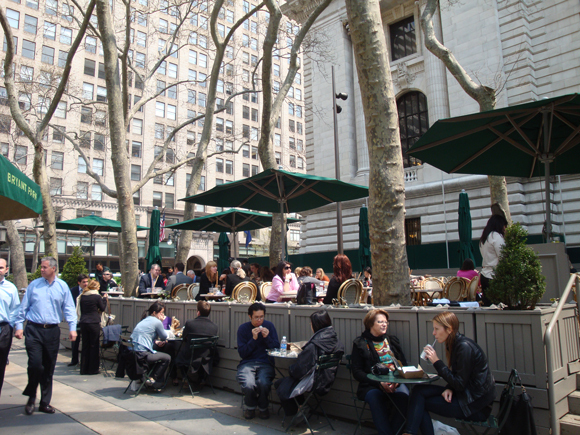 The good news is that when the truly beautiful days roll around, you can celebrate with happy hour or a meal al fresco at the Bryant Park Cafe. Located at the northeast corner of the park, the Cafe is the open-air sibling of the Bryant Park Grill and serves up a more casual New-American menu and excellent after-work bar scene. Until the weather gives us more consistent sunny weather (enough of this rain already! ), keep up to date with the Cafe's open days on the Bryant Park Grill Facebook page or by following @BryantParkGrill on Twitter. You can also call 212-840-6500 for more information.